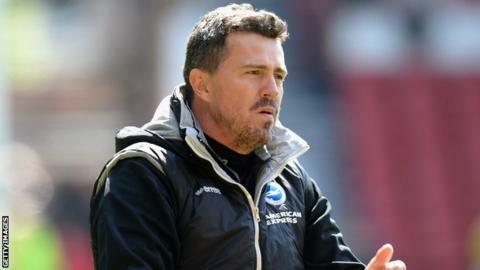 Brighton head coach Oscar Garcia says Derby County are favourites in their Championship play-off semi-final. The Seagulls welcome the Rams to the Amex Stadium for the first leg of their semi-final tie on Thursday evening. "We know we are the underdogs as they finished third, are the top-scoring team in the league and beat us home and away," Garcia told BBC Sussex. "But in football anything can happen and with the players we have, everybody can trust that we will fight." Thursday, 8 May: Brighton & Hove Albion v Derby County, 19:45 BST. Sunday, 11 May: Derby County v Brighton & Hove Albion, 17:15 BST. Albion secured their place in the play-offs on the last day of the regular campaign thanks to Leonardo Ulloa's stoppage-time winner against Nottingham Forest. The Sussex side finished the season with an eight-match unbeaten run to seal a sixth-placed finish. "We showed great character and never gave up," 41-year-old Spaniard Garcia added. "It is a characteristic of this team. "For me it is not a surprise that we would be fighting until the end. "Big players want to play in big games. We are in football to play these kind of games. "As a manager and a player, everybody needs to enjoy it." Brighton reached the play-off semi-finals last season but lost out to arch rivals Crystal Palace 2-0 on aggregate after being beaten at home in the second leg. "Last year in the first game we played well and were unlucky to not get a result," Albion skipper Gordon Greer told BBC Sussex. "In the home game we went a goal down and had to push everything to get back in the game. We can use that disappointment and hopefully we can do it this year. "We will be giving everything we have got as it is a dream to go up through the play-offs." Brighton lost both previous meetings with Derby this season, suffering a 2-1 defeat at the Amex in early August and a 1-0 reverse at the iPro Stadium in mid-January. "I hear people talking about the advantages and disadvantages but we've got two games against a good team," the 33-year-old centre-back added. "It is up to us to put on two good performances. "Derby have beaten us twice but this is the one that matters and hopefully we can get a result. "It will be a wee bit cagey in the first game but we will be going out there to win the game."